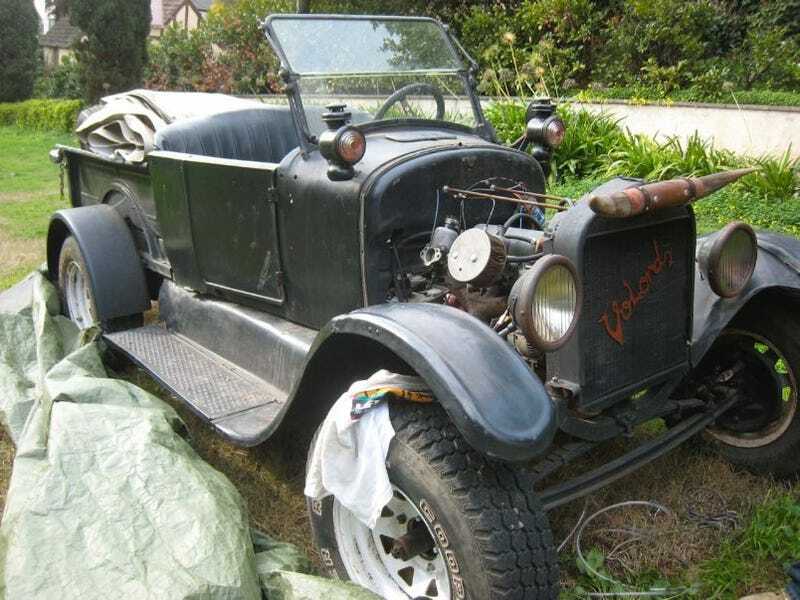 When You Need To Make That Old Truck Run This Weekend: Volvo-Powered Model T! When you've got a basket-case Model T on one side of the garage and a beat-to-crap Volvo Amazon on the other… and you want something cool to drive in, oh, 48 hours, what to do? Well, if you're the kind of guy who has about 47 crazy car projects going on at any given moment, you drop the Amazon's engine and transmission into the Ford, then scrounge up everything else you need from random boxes of parts. The result: Volord! I met Anthony, the Volord's creator, when I went to his place to buy my personal Hell Project. He was selling the Sprite to clear some space for more cars; you can see why in the photo above, which shows a tiny fraction of his collection: a daily-driver Scout, a genuine wrecked-in-the-TV-show General Lee Charger, and a Buick GS convertible. Yes, Volvo fans, that is a bit of P1800 you're seeing on the right side of the image; there's an original 500-mile Amazon wagon in the shed as well. The good ol' Volvo B18 does a fine job of moving this truck. We'll be looking for it at the next Billetproof Nor-Car. These connecting-rod taillights really go well with the Pabst-can coil cover and floorless interior. This is the kind of rat rod we like best: built cheaply from stuff on hand, yet not overboard on hipster irony. This thing would look good parked next to the Granada Rod! Naturally, anyone who would build the Volord would be a vintage Model T racer. No roll cage, no brakes (just transmission bands, or whatever the hell those things are called), helmets optional. 75 in this thing probably feels like 190 in a Beetle!